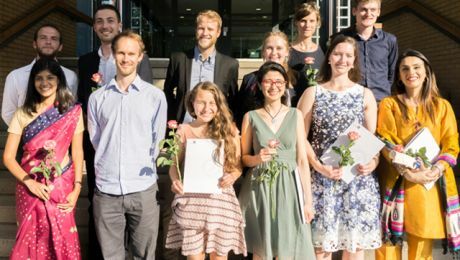 In July, the second graduating class of the International Joint Master’s Programme in Geography of Environmental Risks and Human Security celebrated the completion of their studies. 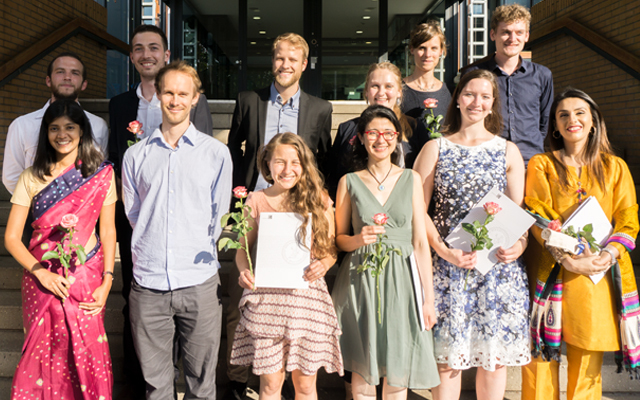 The 12 graduates of this master’s degree programme — offered by the UNU Institute for Environment and Human Security (UNU-EHS) in partnership with the Geographical Institute of the University of Bonn — gathered with their families and friends to receive their certificates. The graduation ceremony was the culmination of three semesters of studies, including field trips and an eight-week-long internship, followed by a semester of research and writing a master’s thesis, all under the mentorship of advisers from both UNU-EHS and University of Bonn. Professor Jakob Rhyner, Director of UNU-EHS and UNU Vice-Rector in Europe, welcomed and congratulated the graduates and their families, followed by Professor Julia Verne of the Geographical Institute at the University of Bonn and Dr. Matthias Garschagen of UNU-EHS. Several graduates spoke of their studies: Shehrbano Sumbal and Lena Grossmann recounted their academic and personal journeys of the last two years, Joseph Cook read a self-written poem, and Liliana Narvaez Marulanda described her experiences and research into volcanoes. Applications for the Joint Master’s Programme in Geography of Environmental Risks and Human Security open in the fall each year. Admissions for entrance into the programme for the 2019 fall semester will be announced on the UNU-EHS website as well as through the UNU-EHS social channels.